How does one pay tribute to a loyal and deeply respected friend? Ian was always very loyal and committed to whatever he did. And the most important of those commitments was to his family and friends. His very sincere, honest and caring qualities gained the respect and love of those immediately around him. His intelligence and a keen sense of humour made him great company to be with. His loyalty in friendships was absolute. What he expected from others he gave back in full measure. He developed some deep interests during his lifetime and some of these are reflected in his Quilt. He was a very talented engineer and contributed in some very visible ways throughout New Zealand. He had a deep interest in architecture and appreciated the relationships between form and function. He was a talented sportsman and continued to play until a few weeks before his death. He was a meticulous planner and paid great attention to detail. He liked to be in control and to be reliable. He felt friendships were most important in his life. The Quilt has another very important significance. It is the only tangible recognition of the reason for his death. It is so important that we work to prevent suffering due to ignorance and prejudice. In memory of a very loyal and much-missed friend. 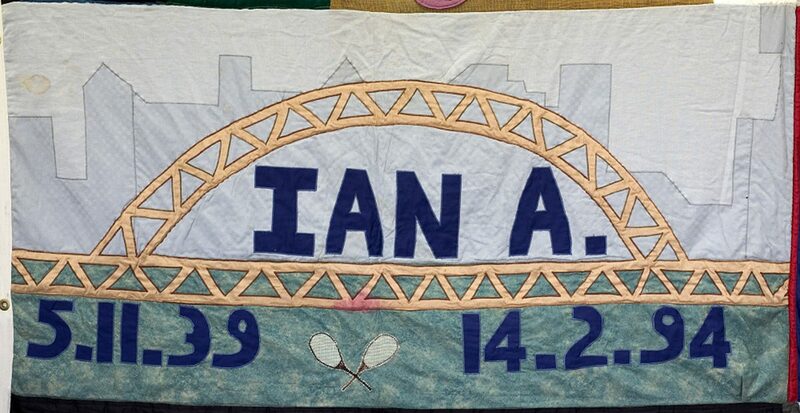 The bridge and the cityscape which formed the background, represent the fact that Ian was a very talented engineer. His surname was not included in deference to his family and others who were unable themselves to deal with the fact that his death was AIDS-related or who did not perhaps know that Ian was gay (he was not “out of the closet”). The crossed tennis racquets are there to show his love for the sport.